You agree, don’t you, that at the end of the day it is the cost that matters most when you’re paying for your foreign trip. 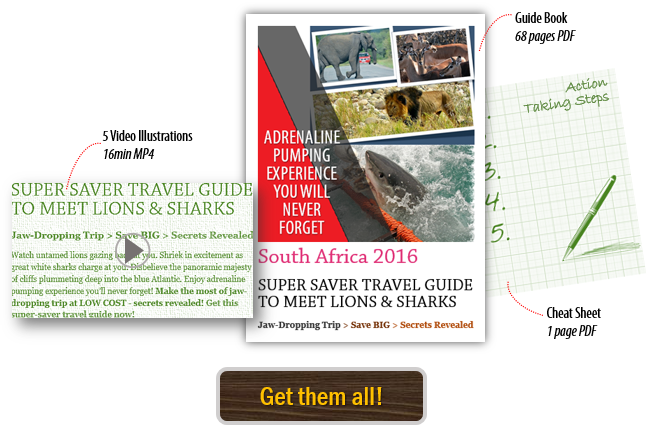 So when we found that we had spent just around 110,000 rupees per person ex-Mumbai for our spectacular 12-day trip to South Africa in end-December 2015 that included seeing lions, wild dogs, sharks, whales, seals, and penguins in their natural habitat, our joy knew no bounds. 6 weeks have passed since as I write this article. Yet the thrill of pulling it off at such a reasonable cost, which is easily at least 50-60% less than what the tour companies charge in India, still makes me intensely excited and elated, giving me goosebumps. The joy is even more when I discover that I’ve finally cracked the code of cutting costs substantially by managing foreign trips ourselves instead of being at the mercy of the tour companies. Did I say managing foreign trip yourself? Hmm, I’m aware, for most safe-playing middle-class Indians that is strictly a no-no! Now that is an irony. Indeed so! Because when you’re paying the tour companies you are actually paying much more than what it actually costs. And in the process – tragically – you’re seeing much, much less. Take a deep breath. Close your eyes…and imagine! I can see you eager to know how we did this. And frankly I’m not the type to pull back anything from you. But guess what, the cost of the trip was farthest in our mind when we drew close to a group of 4 lionesses and a young lion idling away near a small pool of water, not far from where our vehicle stood. This happened on the second day of our trip to the Kruger National Park. It had rained heavily the evening before and the early morning air still smelt of moist grass. FJ, our 6 feet 8 inches South African guide, alert and affable, quickly took the detour off the main road from Skukuza rest camp when he was tipped off by the guide of the camper-van coming from opposite. We stopped just 15 feet away from the beasts even as FJ switched off the engine. A motley group of 11 persons from faraway corners of the world, FJ held us captive to his crisp commentary on the pride of 22 lions active in that area of which the 5 before us made a splinter group. The lions paid no heed though, to whatever we were doing. And for almost 20 minutes, save for occasional chatter among ourselves, we clicked away their every move as they changed their sleeping postures ever so often, much to our delight. We knew then that our day had begun well. Not long after seeing the lions, we came across hordes of elephants, zebras, giraffes, quite a few rhinoceros, some buffaloes, hippos, and also hyenas (a few soaked with blood on their fronts) – not to speak of scores of impalas, some kudus, bushbucks, elands, warthogs, and more. Later, in the evening safari, we even saw a black rhino, an endangered species counting only 200 in Kruger. It had a deep gash just above right left hind leg probably resulting from a fight. Our luck favored so much since it was cool, as it had rained the evening before – our first day at the park. It was ideal, we were told, for the animals to come out in large numbers in search of food and water. Skukuza rest camp is where we stayed for 2 nights and 3 days. It is the largest rest camp and the admin headquarter of the Kruger National Park or KNP. The tour organizer put us up in twin-sharing tents, but on the second night we changed to air-conditioned bungalow with en-suite bathroom, a kitchenette, a refrigerator, and crockery for cooking food. We didn’t cook though, and who would, given the sumptuous meals – breakfast and dinner – the tour organizer served us! If you’re not fussy about having pork, beef, and assorted vegetables cooked the African way, and some fine wines from Stellenbosch and elsewhere, you’re bound to have a gala time. In fact, the dinners in the campsite were simply superb…what with the wine and conversation flowing freely among travelers from all over the world, all here together to experience the magic of Kruger. The third day at Kruger was the one I won’t forget for a long time. Just a kilometer outside the camp where the road intersected in a crossing, to the left there was a melee of cars. We immediately sensed there must be something there. And we were not disappointed. A pack of 7-8 wild dogs were in hunting mood, hungry, bellicose, and wandering about. Suddenly, 2 dogs ran wild, crossing the road to the left, and ahead of them ran a frightened impala. All 3 vanished in the wood in a flash, but the chase was shortlived. The dogs came back after about a minute panting, then joining others to continue hunting. We had to leave as the queue of vehicles started getting longer. Had we stayed, I told myself, we’d have surely witnessed the canines bringing down a prey, an impala or a kudu. A sense of achievement soared inside us, considering especially that wild dogs were an endangered species in Kruger, numbering just about 150 in the whole of 360km by 60km jungle. What we saw next was like an episode straight from a NatGeo serial. The day before, in the evening, we had passed by the carcass of a baby hippo, presumably killed by a passing vehicle. And, as it should be, we also saw quite a few vultures hanging around. 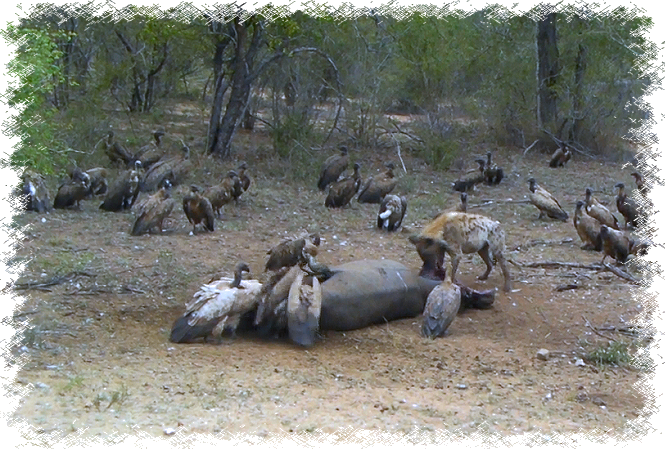 To our question why they were not feasting on the carcass as yet, our guide had replied that the vultures couldn’t penetrate the thick skin of the dead hippo. They must wait for hyenas to tear open the flesh. What we today witnessed was momentous. A veritable feast was going on in the wild. The hyenas were there, and at least 4-5 vultures were pushing, fighting, shoving one another for a vantage point to pick the flesh, while others waited patiently in the wings. At last we faced the truth…exposing itself! Compared to Kruger, the days in Joburg were like anticlimax. We knew this, so we also knew that in Joburg we should be educating ourselves on the history of the apartheid, and the freedom struggle. We had booked an entire studio apartment that comfortably slept 4 people (we were 3). It also had a kitchen and an en-suite bathroom. The comfort of private living was soothing. It cost less, you can move your limbs freely, and you won’t undergo the stifling environ of an expensive hotel just for the sake of free breakfast (tour companies do that!). The day we arrived from Kruger (dropped by the Kruger tour company) was 2 days prior to Christmas. So our first priority was to buy some eatables to cook and eat for 2 days. 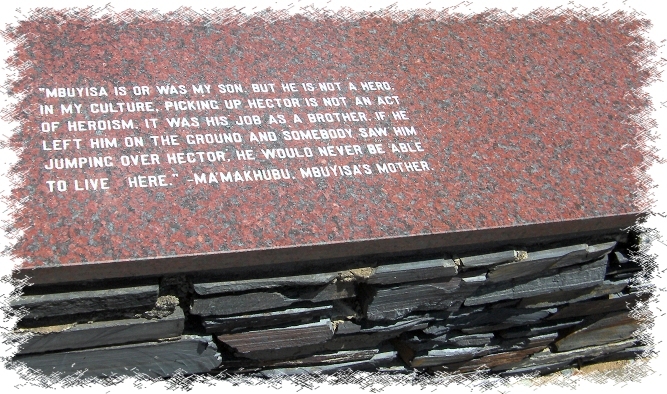 The following day we went about seeing Joburg. We had booked the open-top hop-on-hop-off red sightseeing bus to see the major places in the city including a separate trip to Soweto, the famous South Western Township…so mingled with the struggle for equality. We enjoyed the fascinating trip. We probed at how Joburg, a city perched at 5750 feet above MSL and away from any natural source of water, could develop as a modern metropolis. This was all because of the hunt for gold, and indeed the city sported remnants of opencast gold mines that once were beehives of frenzied activities. The colorful history of Soweto apart, what amazed us was the Apartheid Museum. Not only was the history of struggle so imaginatively explained, the entire museum bore signs of an intense desire to preserve the tales of fights for dignity…that should be told to the visitors. If you’re up to this point, you must read our splendid 5-days in Cape Town. And how we spent neck-deep in the Atlantic watching the great white sharks charging menacingly at us! And the low cost of our spectacular travel? Over to our splendid 5 days in Cape Town! Meanwhile, as a fellow traveler if you want to shave off costly dollars or rupees from your spending budget, get hold of my uber-cheap travel guide package below.